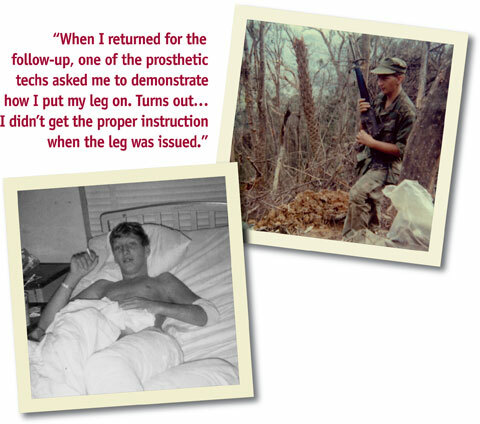 On a Marine Corps operation in the DMZ in April 1969, VVA New York State Council President Ned Foote was third man back in a point team hit by Claymore blasts that “took out nine of ustwo killed, seven injured.” Foote lost his lower left leg and was medevaced to the U.S.S. Sanctuary to undergo the first of many surgeries. After a stop in Guam for more surgery, Foote went on to the St. Albans Naval Hospital on Long Island. It was a life-changing meeting. Sampson owned an independent prosthetics company that contracted with the VA, and he brought a patient-centered approach to his work that the VA did not offer. “Not the VA of 1970, anyway,” Foote said. He worked with Sampson and later with his son, Bill, Jr., who took over the company after the elder Sampson retired. 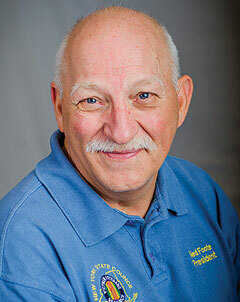 Bill Sampson, Jr., has been Foote’s prosthetist for forty years. Foote, recalling his visit to Walter Reed’s gleaming Amputee Service with its large bright rooms filled with physical therapy equipment, said that “it’s great to see what’s available to our young vets. It’s as it should be. But at the same time I can’t help but feel a bit of sadness and disappointment that Vietnam amputees got so little and had to fight so hard to even get that. My own story is just one small piece of it, but it’s all therethe limited options, battles for care, delays, excuses.